The Client (Eui-roi-in) is South Korean variation on so called courtroom thriller genre directed by director Young-Sung Sohn. Han Cheol-min (Hyuk Jang) returns home from a car ride on his wedding anniversary, holding bouquet of flowers for his wife he proceeds to apartment building, which is surrounded by crowd of curious bystanders. After he gets past them, stepping into apartment he meets several policeman who are investigating crime scene. A crime scene in his home. There's blood everywhere in bedroom, and his wife is missing. Immediately Han Cheol-min is arrested for murder of his wife. Circumstances of crime are puzzling, and with inconclusive evidence, a legal battle in halls of justice begins between prosecutor Ahn Min-Ho (Hee-soon Park) and defense lawyer Kang Seong-Hee (Jung-woo Ha), each convinced of their own truth about Han Cheol-min. What will trial uncover? 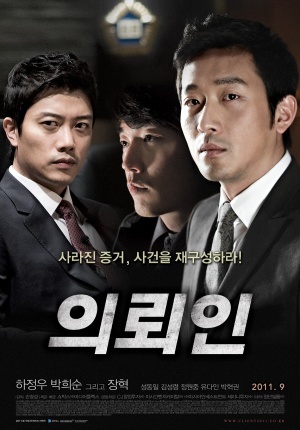 While this movie can be labeled as courtroom thriller (and it's pitched as first one for South Korea, but I am not so sure about it, and with no way to verify, we'll leave it at that) as it involves everything that such films need, a crime, a defendant, and whole might of justice system, it is not strictly spent inside courtroom. The dose of mystery surrounding the crime, and investigations put in place by involved parties are in focus, trial is just what ties it together. Good performance by actors, fine cinematography and intriguing crime mystery for a plot. A thriller in best traditions of Korean cinema. While fans of courtroom films won't be overly surprised by events in this film, it's a solid example of such genre. A proper thriller flick, worth checking out.